Barclay Cycle Hire is fantastic, but the inability to ever find a docking space in Soho at 10am will quickly lead to craving a bike of one’s own. 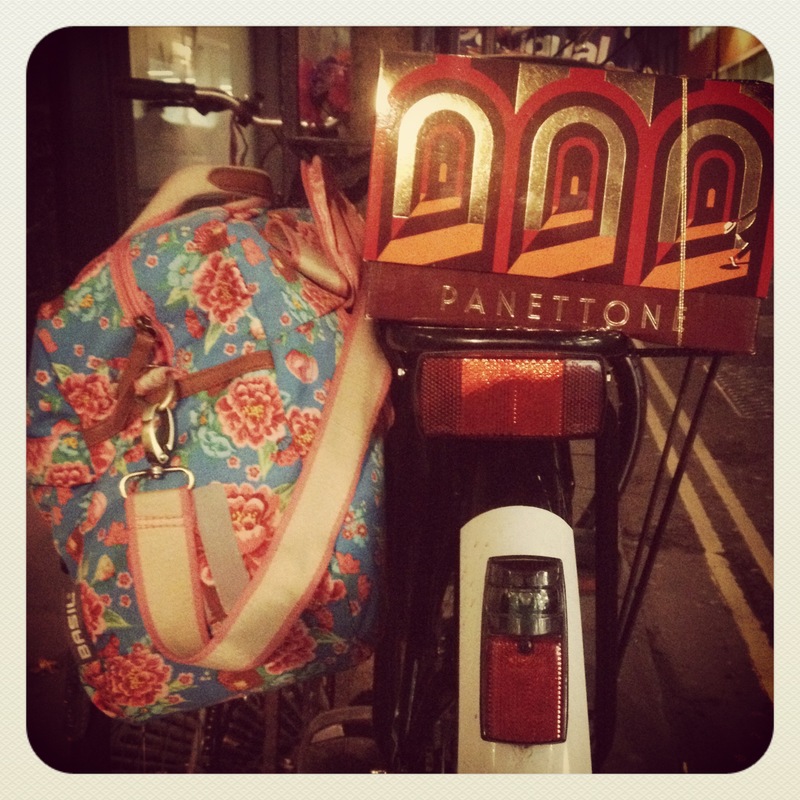 When I forfeited my zone 1-2 travelcard and put the money saved towards buying a bicycle, it was life-changing. Not always in a good way, I would think whilst battling against gale-force winds in the depths of winter and recalling the stuffy warmth of the Central Line. But mostly . . . mostly it was great. I was lucky because my boyfriend had previously done extensive research, and Workcycles – a small Dutch company, based in Amsterdam – had consistently come out on top. They have some international suppliers, but their presence in the UK is small enough that encountering a fellow owner causes much excitement and frenzied waving. I was loathe to buy what’s effectively the girls’ version of my boyfriend’s bike (I mean, I don’t even match my nail varnish) but the facts were inescapable: the Oma was a bloody good bicycle and fit all my criteria. She’s built with an Azor frame and Workcycles’ carefully-chosen amendments, so I researched, read blog posts, followed other Azor-riders – on twitter, not literally – although we did track down the one very amenable Oma-owner within a 50 mile radius for a brief try-before-you-buy. Although I was saddened that the Oma only came in two colours (black or black – seriously – albeit matt or gloss), I decided it would allow me to decorate her in my own inimitable style. I’ve now owned my lovely Oma (her name is Grazel) for 16 months and can happily say that buying her was absolutely the right decision and, dear readers, I will tell you why . . .
I’ve suffered from back and shoulder pain throughout my life, and was aware that hunching over handlebars exacerbated this. Whilst even riding the almost-upright Boris Bikes to and from work left me aching, I simply don’t get that with Grazel. She’s a smooth, comfortable ride, and is so huge that she takes most of the impact from potholes. The best possible description is “stately”. The Azor frame comes in four sizes (I’m 5’8″ and have the 57cm). You can raise/lower both the saddle and handlebars to fit your arm length and riding style. It takes a bit of wiggling but once there, it fits like a glove. 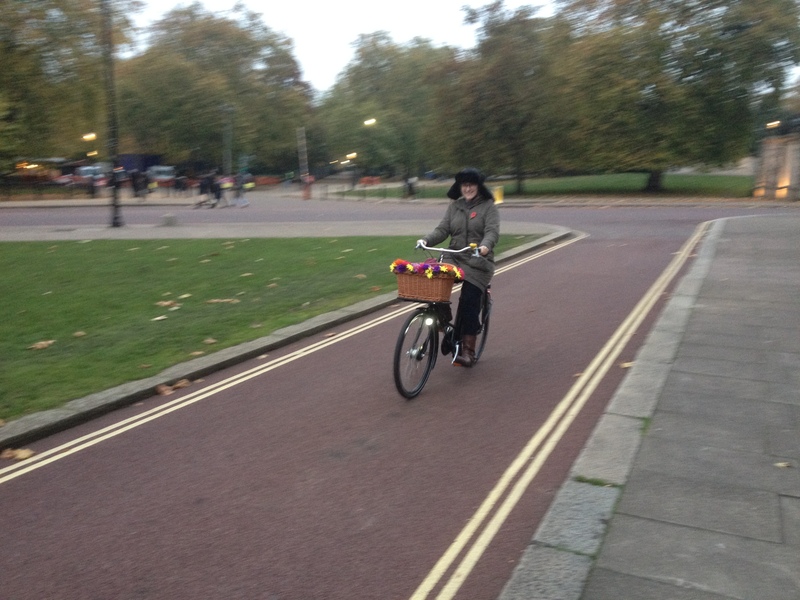 In London, safety is everything, and I wanted to feel protected. My boyfriend was once hit by a car whilst on his Workcycle and only the front forks needed straightening out, whereas a titanium frame would likely have crumpled underneath him. I decided I would rather arrive somewhere ten minutes slower, but in one piece – and Grazel fits the bill. She’s sturdy, so isn’t too affected by wind, and you might as well get the mega hard-core tyres (Schwalbe Marathon Plus), fancy Brooks saddle, basket, or fairy lights (any excuse) since at a base weight of 25kg, such additions won’t affect your speed. The weight does require some compromises. I can’t carry her up a flight of stairs (I have to ask my boyfriend every time, through my gritted feminist teeth), and hills are hard-going, but certainly not impossible. But she’s far less likely to be stolen, and once rolling along flat ground, little stops her. I can’t dash away from traffic lights, but I take great delight in cruising downhill with nary a pedal rotation. She’s the bike equivalent of a Rolls Royce, or the tortoise against the road bike’s hare; slow and steady wins the race, or at the very least arrives looking utterly glorious. I owned two cars for a total of thirteen years and never once changed the oil on either. Regardless of how much time I hoped I would dedicate to my bicycle’s upkeep, the reality was simple: I wouldn’t spend a single moment. I wanted a bike which would requite the absolute bare minimum of maintenance, and by bare minimum, I meant none whatsoever. Happily, the Oma is my girl. As one Cambridge-based bike seller and mechanic told me: “I don’t make a penny off maintenance on these bikes. Once I sell them, I never see them again. They just don’t have any problems”. I’m told that daily maintenance is usually standard but for the Oma, it’s non-existent. Put it this way: in 16 months, I have never oiled the chain, never cleaned anything, never changed a tyre (touch wood!!) . . . oh, and I keep her outside, all year round. This is because everything is internal: the gears and brakes are hidden away in the wheel hubs, and the chain is enclosed in a plastic case, so everything’s protected from the elements. In fact, when my Kryptonite lock stopped working, I was astonished to discover that I should have been oiling it regularly, and the nice people at Evans Cycles were astonished that I hadn’t. Well, I don’t oil anything else. I’ve taken Grazel for a service once (admittedly she’s due another) and on one occasion the chain fell off, possibly because she fell over on a train. But other than that, I just leave her in the wind and rain, then hop on and off I go. I didn’t want to change my life because I’d started riding a bike, and with the Oma, I didn’t have to. Lycra and cycle-specific clothing are entirely unnecessary. The enclosed chain case means my clothes are protected. I’ve even cycled in a pure white maxi dress and lived to tell the tale. I upgraded my pedals to these amazing ergonomic ones, partly because the blurb on the packet seemed legit, but mostly because with the rough instead of spiky surface, they are much kinder to shoes. I’ve cycled in boots, sandals, platforms, heels and ballet pumps and never had trouble nor damaged my shoes. However, because these pedals are almost twice the size of normal ones, they’d look ridiculous on any other bike; whereas on the Oma, they’re perfectly in proportion. Combined with my Basil panniers, which look like normal bags, I can walk straight into a restaurant or office and nobody knows I’ve just stepped off a bike. Ugly is a matter of opinion. Boring is not. (Let’s be honest: to the untrained eye, there is very little variety between mountain/road/hybrid bikes. All are identical. All are dull). The Oma isn’t perhaps as conventionally pretty as a Bobbin or a Pashley Princess. Where they’re delicate, lightweight, and multicoloured, she’s sturdy, hefty and monochrome. Where they’re retro, she’s built in the traditional style (there is a difference). But Grazel is the result of true craftmanship, has an elegance in the details of her engineering, and next to other bicycles, is simply magnificent. Unlike those superficial, faux-vintage copycats, she’s just so well-made and that’s beautiful in itself. If/when I change the current saddle (Selle Royale – comfortable but graceless), she’ll be even more classically charming. Besides which, cover a basket in a meadow of flowers and now who’s pretty? Simply put: I carry loads of crap. I wanted my bike to do it for me. Most days I just have one very heavy pannier attached to one side of the rear rack and it has no influence on the handling or stability. I’ve even carried my boyfriend on it – trust me, that back rack is seriously sturdy. The Oma also comes (optionally) with a removable front rack. This allows a basket to be attached to the frame and not the handlebars or the wheel, so the steering isn’t affected. I attached my basket to the rack with cable ties so I can still easily remove the entire rack (not that I would ever want to because it’s literally blooming gorgeous). I regularly fill the basket with heavy shopping and bulky items. I’ve simply never had to adjust my consumerist behaviour: hurrah! On one memorable occasion immediately before Christmas, I schlepped home four bottles of champagne, various items of clothing, a selection of presents, and an enormous panettone. There is no way on God’s green earth I could have managed it on any other bicycle. It’s all relative, of course, but buying it through the Cycle To Work scheme helped enormously here. In the end, with all of the accoutrements, I paid around £55 per month for a year, with a final one-off payment at the end. That’s considerably less than a travelcard. I didn’t feel that I skimped on any of the extras I wanted, but equally, I would have been prepared to pay more. Since then, the only payments I’ve made have been buying more flowers for the basket. I can’t bear the cycling forums. I ducked in to a couple when I was first researching and realised, quite simply: I don’t care. I DON’T CARE ABOUT GEAR MANUFACTURERS AND THE BENEFITS OF HUB BRAKES. Much like the relationship I have with my body, wi-fi router, and tax contributions as a PAYE employee, I just want my bicycle to work without worrying about the mechanics of it all. I can’t wade through the technical crap. I’m thinking about other stuff. I don’t care. With the Oma: I don’t have to. She works. It’s brilliant. No upkeep, no specific understanding, no technical knowledge. No need to sit around discussing brake cables or speeds. No spanners in the pannier, or puncture repair kits in the basket; no WD40, broken nails, intimate knowledge of wheel ratios or being on first-name terms with the guys at the local repair shop. Just an annual check-up, then throw your handbag in the basket, get on . . . and go. It doesn’t get much more convenient, enjoyable, easy or pleasant than that. Got the equivalent bicycle for the Azor dealer in Dublin last September. I am a guy but stil went for the step thru frame and haven’t regretted once. It’s just so easy to get on an off, especially when fully loaded. I have used it all through the winter, knowing it’s always ready to carry me and what ever stuff I need anytime day or night. Brilliant choice ! Fantastic, I’m so glad to hear it! I totally agree that it’s not just a “girls'” bike. The guy I mentioned whose bike I tried out is also (obviously!) a man and he said much the same thing; in fact in Holland it’s apparently really common. It’s just more practical being step-through, and it doesn’t affect the strength whatsoever. I also think it’s better for your back, being more upright. Anyway, I’m always delighted to hear from people who love the Oma as much as I do 🙂 Thanks for stopping by! Robyn, that is a fantastic write up on the amazing features of these work horses and the style of riding they are most ideal for. I’ve been importing and selling Dutch bikes to the US for over 7 years now and have been a Workcycles dealer for the last three and I can attest the quality & durability of Workcycles is 2nd to none and as you point out it is true that we sadly don’t see many of our customers after their purchase because the bikes require so little in terms of maintenance. Bravo on a great post and thank you! Thank you so much Jon! I really appreciate hearing that from someone who clearly knows the mechanical ins and outs far better than I 🙂 Do you sell many WorkCycles? I do hope so. Thank you so much for reading the post and taking the time to comment! Robyn, I have a very good friend who would adore this bike (and the accessories). I haven’t cycled for ages and couldn’t even tell you what my cycle-needs are these days. Before, it was the ability to attach a child-seat to the back and cycle a large baby to and from nursery. This is no longer a requirement, as the next time the kids get on a bike, I hope it will be their own bikes, therefore allowing me to cycle independently, without tiny passengers. I have a run-of-the-mill hybrid sitting under the lean-to in the garden. It is a little un-loved at present (sad times). There is absolutely nothing ugly about this bike. Nothing. As you say, faux-vintage is incredibly dull. This is the real-thing, and that in itself is a beautiful thing. The minimal maintenance sounds terrific. I’m so glad I read this, as the next time I’m in the market for a bike purchase, I will be referring to Workcycles. I’m really glad you agree about how beautiful she is 🙂 I won’t repeat myself . . . I love her!!! I really hope it’s not too long until your little ones are ready to take to the road under their own steam! I will tell her about the WorkCycles – I think she’ll like the originality of them. Never worry about a delay in response! I’ve become a serial offender when it comes to not responding to lovely comments on my blog. It is really rather bad. I’m so glad I’ve come across this! I’m looking to start commuting by bike to work. I’m much like you in that all the gear/tech talk about a bike – no interest. I might not be able to start with this one as it’s very much out of my range at the moment. But I will be putting money aside for this; I’ve already found a couple of dealers in the US that sell these. This is great! Hi Amber, thank you so much for leaving this comment. It’s wonderful to hear and I’m really glad I may have been able to help! If you have any questions about the bike that I haven’t addressed, do let me know, and I’d be more than happy to help if I can. I totally understand about the price; it’s an awful lot of money to shell out in one go. I was lucky enough to have been able to buy mine through the UK government’s “Cycle To Work” scheme: essentially your employers buy it on your behalf, and you then pay it off in monthly tax-free installments which makes the whole thing significantly more bearable. I don’t know whether the US offers anything similar? Either way, it’s wonderful to hear that you are starting to save up; I really wish you the best of luck with it and I so hope that you enjoy reaping the rewards when you reach your goal! This has been an interesting post to read in the sense it left me £1,245 shorter in my bank account. 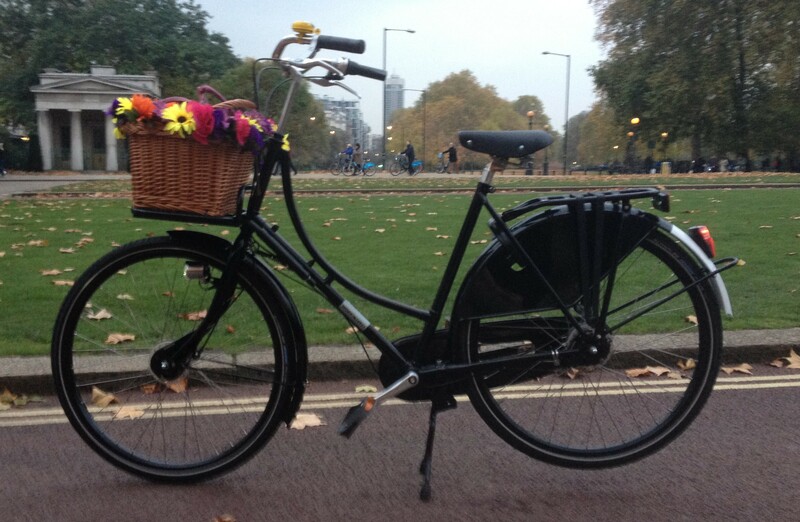 Yes, i have ordered an ‘Oma’ 61cm, 8 speed etc etc.. direct from Workcycles………. I’m so excited, i could burst. I just know this will be the right choice, i’ve exhausted Google resources whilst researching this bike and now i have actually gonne and done the dirty deed. Thanks for sharing your wonderful story. Hi Tim! Thanks so much for commenting, and how fantastic that you’ve bought an Oma!!! I am truly delighted that you made this momentous decision and ever so happy that I may have helped you to reach it 🙂 You absolutely should be excited – best decision ever! I know it’s scarily pricey but honestly I think it’ll pay for itself in what you save on public transport and maintenance. I hope you’ll come back here and post a picture when it arrives. Now you can go and have fun picking the accessories . . . that’s what I did in the intervening time (well that and decorated my basket). 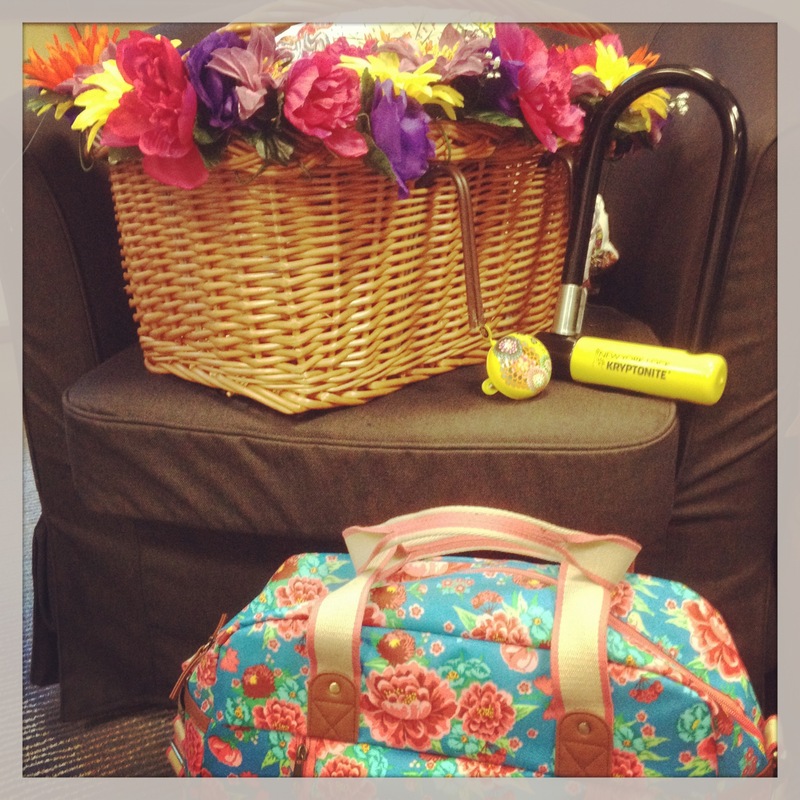 Have an amazing time with you and your new bicycle and I hope the next few weeks go as speedily as possible for you! Such kind words from wherever you may be on the planet. I have been given a 5-6 week delivery slot which seems forever already (boo!!!!!)…. For sure you will get a picture from one of our many Beautiful traffic free cyle trails here in Devon, one is 14 miles long you know the ‘Exe Estuary’ trail, look it up some time. a Workcycles ‘Oma’ so i’m allowed to pee ok ? Be safe on your travels, enjoy life and i look forward to next time. Oh my gosh how exciting!!! And what an unglamorous final place for her to wait 😉 I bought mine from Bikefix in central London and they forgot to order the light with which I’d asked them to replace the standard one, so I had to wait even longer whilst they got hold of it. It was awfully hard to hold on for those extra few days so I share your impatience!! Oh my, that is fantastic! HUGE congratulations on your new arrival 😉 I’m so happy you love her!!! Sorry for the delay myself, I’ve been at Glastonbury festival for the last week and missed your previous messages. But I really am so delighted for you and thrilled that I may have had an influence on your decision, which I never doubted would be a wonderful one 🙂 May she bring you many years of happiness!